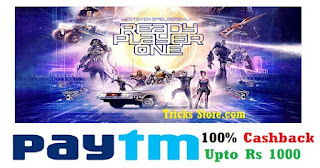 Paytm movie ticket cashback, paytm movie coupon, paytm movie cashback, Paytm Ready Player One Movie Ticket Booking – Hello guys, Here is another mind blowing deal by Paytm Movie. Now get 100% Cashback on Movie ticket of special screening of Ready Player One Movie. Paytm again come up with Movie ticket cashback offer, when you book tickets of Ready Player One Movie you will get the 100% Cashback upto a Maximum of Rs 1000 on booking of 2 Movie Tickets. Maximum cashback is Rs 1000 per user. So Hurry up guys and book your Ready Player One Movie Tickets now and avail this offer. How to Get 100% Cashback On Movie Ticket Booking ? 4). Select the “Movies” (Ready Player One) you wanna watch. Hurry !! You will get the 100% Cashback in your Paytm wallet as soon as your payment will confirmed. * Use Promocode ‘Superfan’ to get 100% Cashback. * The offer is applicable only on Ready Player One Movie tickets booking. * The maximum Cashback amount is Rs. 1000. * Valid only in Selected Big Cities and Special Screening only. * The promocode is valid on a minimum booking of 2 movie tickets. * This Promocode is valid for limited period.